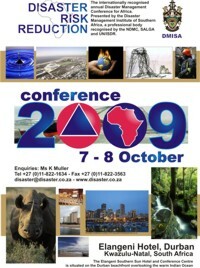 The Annual Conference of the Institute is the biggest annual Disaster Management Conference in Africa and routinely attracts more than 300 delegates. 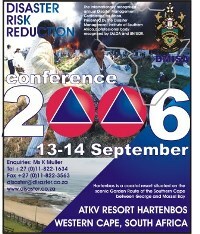 The Institute is recognized as the mouthpiece of the Disaster Management profession in Southern Africa. The conference provides an annual opportunity for a diverse range of stakeholders in disaster management from across Africa to gather and share skills, knowledge and experience. Further information on the 2019 conference will be announced soon. DRR 2018 focused on reducing direct disaster economic losses, aligning with the UNISDR Sendai 7 Campaign’s 2018 Target 3 priority. 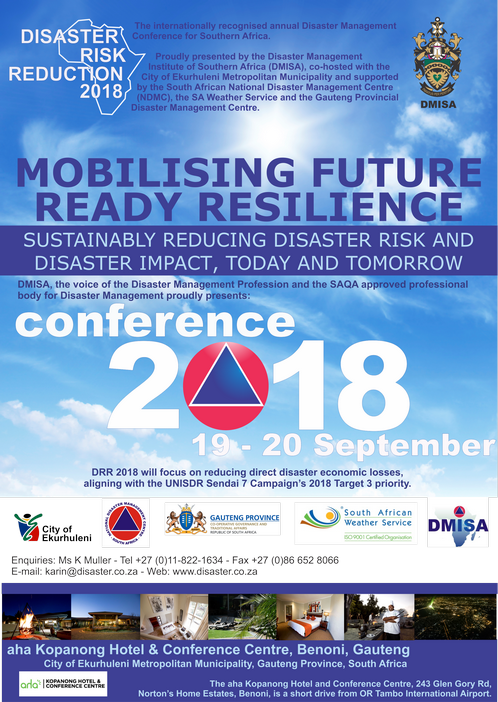 DRR 2018 (19-20 September 2018) was proudly presented by the Disaster Management Institute of Southern Africa (DMISA), co-hosted with the City of Ekurhuleni Metropolitan Municipality and supported by the South African National Disaster Management Centre (NDMC), the SA Weather Service and the Gauteng Provincial Disaster Management Centre. The 2018 conference was held at the aha Kopanong Hotel & Conference Centre, Benoni, in the region of the Ekurhuleni Metropolitan Municipality, Gauteng, South Africa. 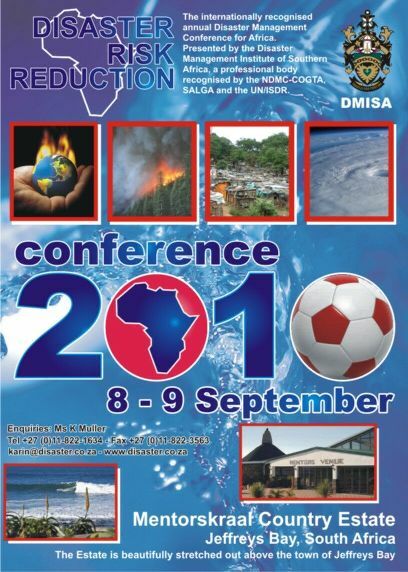 The Disaster Management Institute of Southern Africa (DMISA) Conference held this past week has indicated the strong working relationship between Disaster Management Institute of Southern Africa (DMISA) and the National Disaster Management Centre. The fact that the Minister of COGTA, the Gauteng MEC for COGTA, the acting Mayor for Ekurhuleni and so many other senior political leaders were present and participated in the discussions, was a strong indicator of the political support of Government to reducing disaster risk. It is imperative that the commitments made by political leadership to increase and expand Disaster Management activities is a major boost for the function and for the people of South Africa who are more and more faced with serious natural and technological disasters. Discipline in the profession is strong when it is able to provide for critical introspection. The number of academics who provided results of research papers assists DMISA with ensuring self-discipline and introspection. South Africa can be proud of the many disaster risk reduction initiatives and disaster response activities taking place in the country, including activities in other sector departments that do not necessarily recognise that the good work they are doing is contributing to disaster risk reduction. We have come a long way in the field of Disaster Management and Disaster Risk Reduction but realise that resilience is often more of an aspirational goal than something that is immediately achievable and recognise that much hard work remains. 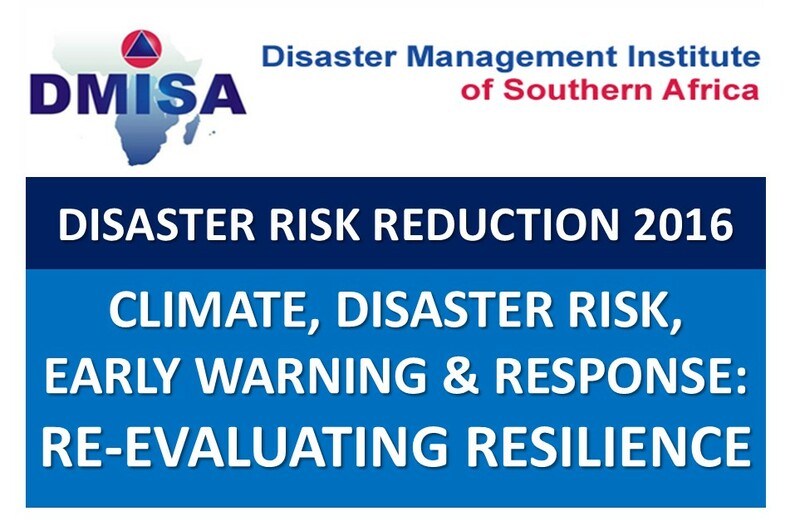 To this end the Disaster Management Institute of Southern Africa (DMISA) is committed with relevant stakeholders to work on resolving common gaps and especially the risks associated with Climate Change. We were encouraged by all the examples of practical implementation of Disaster Management across South Africa that was shared with us at this conference and look forward to ongoing engagements of a similar nature. DMISA requests the National Disaster Management Centre to appeal to national priority lead agents, to commit to the institutionalisation of a national multi-hazard early warning system. The formalization and establishment of institutional arrangements for a national multi-hazard early warning system, must address ALL national priority threats, and ensure that they are linked to relevant risk reduction efforts and not only those focusing on severe weather. The role of the national government in creating, maintaining and updating early warning systems at all appropriate levels, ensuring that they are integrated into governmental policy and decision-making processes and emergency management systems at both the national and local levels. The feedback from the disaster managers with regards to these warnings has been that all they need to know is “what is going to happen, when, where and how serious it is”. A national multi-hazard early warning system needs to provide easy-to-understand information that is useful, timeous and relevant to disaster managers as well as to the general public. These warnings need to communicate the level of severity, related to the impacts expected, and the likelihood of these impacts to occur. This is translated into a need to move from what the hazard will be to what the hazard will do. DMISA requests The National Disaster Management Centre and the Forensic Pathology Services to jointly plan for mass fatalities with municipalities. The removal of bodies from scenes of death by Forensic Pathology Services responders is mostly the only exposure that other response services get in dealing with Forensic Pathology Services. There are several minimum standards of compliance for mortuary facilities within a typical working environment. These service delivery requirements demand appropriate spaces and resources to support each stage of the medico-legal death investigation. The overall disaster preparedness for mass fatality management, requires continuous planning, involvement and partnerships in line with the Disaster Preparedness Framework between Forensic Pathology Services and local Disaster Management Centres and other stakeholders. 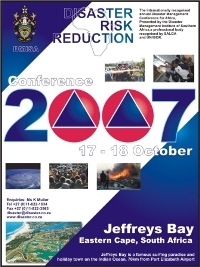 Paper Title: The Western Cape Drought Disaster Preventing Day Zero-What if? DMISA requests the National Disaster Management Centre and the South African Local Government Association to engage with the Department of Water and Sanitation to Develop clear guidelines regarding water ownership and delegations in terms of the National Water Act and the Water Services Act. The “Blame Game” arises because there is currently lack of clarity of what and when the National Department of Water & Sanitation (National Water Act) and Municipalities and water authorities (Water Services Act) and where the responsibility is vested in the National Department of Agriculture. The proposed guidelines will provide clarity on who is legally responsible for the management of water / droughts i.e. the hazard owner and who must pay for what. DMISA urges the National Disaster Management Centre, to develop “Emergency Procurement Procedures” that will eliminate bureaucracy in declared disasters. DMISA further requests the South African Local Government Association the South African Local Government Association to assist municipalities to develop similar procedures. In spite of both the Public Finance Management Act and the Local Government Municipal Finance Management Act making provision for emergency procurement, there is a reluctance to make use of these provisions. This results in delays in procurement and expenditure of disaster relief funding. The development of a directive of emergency procurement in declared disasters will remove any obstacles and ensure appropriate response to declared disasters. DMISA requests the National Disaster Management Centre to develop guidelines so that all stakeholders make use of the Disaster Management Act and Framework principles, mechanisms and systems when addressing a Declared “National”, “Provincial” and “Municipal” disaster. The failure of politicians and sectoral departments to work within the principles of the Disaster Management Act and Framework results in a “silo” approach and does not provide a focused integrated and coordinated approach to dealing with the complex issues and consequences of disasters. Having National guidelines will assist in overcoming this challenge. This can be further strengthened by defining when a disaster is addressed in terms of other legislation. Once a disaster is declared it means the section 2. (b) of the Disaster Management Act no longer applies. The guidelines also need to address a “hand over” process when a disaster is declared. Paper Title: The Green Book: planning support tool for identifying and adapting South African Settlements at risk to the impacts of climate change. It is estimated that a growing number of people in South African cities and towns will be exposed to the devastating impacts of weather induced natural hazards such as flooding, heat waves, droughts, coastal flooding, wildfires and storms. This growing exposure can be partly attributed to a growing urbanizing population, related land use practices and changes projected in the frequency and intensity of weather related natural hazards. Knowing what to adapt for and how to adapt for this change is of critical importance to decision makers involved in the design and planning of human settlements. The Green Book was therefore commissioned with the aim of supporting municipal planning on the development of climate-resilient cities and settlements through research in climate adaptation, ultimately facilitating the mainstreaming of climate change adaptation and disaster risk reduction into local government planning instruments. Paper Title: Drought Risk Information Management: Western Cape Experience. DMISA urges the National Disaster Management Centre to facilitate the establishment of a National Disaster Management Spatial Forum to oversee the development of credible hazard and risk data. There is a need to establish a Spatial Information Forum which will ensure that credible data sets are available to stakeholders to inform decision making. The structure must include all stakeholders who are addressing water security, economic security, humanitarian relief, safety and security as well as communications. These work streams all required specific information to guide their decision making processes. Vast amounts of data relating to the drought, such as dam levels, water demand and supply, infrastructure data (Telkom, Eskom, Transnet and other infrastructure services), and the location of essential services, such as hospitals and schools, is required. The various data sets must be combined in the development of the risk profiles and risk registers for the different disasters that can occur in municipalities, provinces and nationally, so that informed risk reduction interventions (hard and soft measures) can be developed. 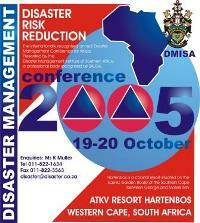 These resolutions will be placed on the Disaster Management Institute of Southern Africa (DMISA) website. That the National Disaster Management Centre be requested to place these resolutions on the agenda of the NDMC-DMISA working group so that an implementation strategy can be developed. That the South African Local Government Association be requested to work with the National Disaster Management Centre and municipalities to ensure that these resolutions are addressed and implemented in municipalities and communities at risk. 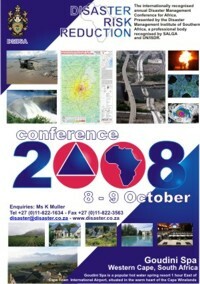 To request The National Disaster Management Centre and the South African Local Government Association to promote the integration of geospatial techniques into disaster (fire) risk assessments. 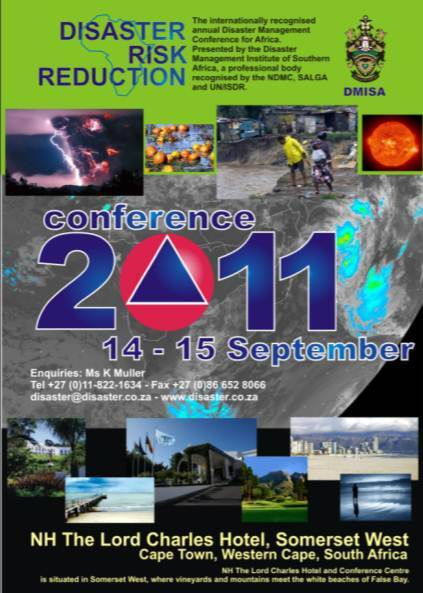 DMISA urges all disaster management stakeholders to ensure that geospatial techniques are integrated into disaster (fire) risk assessments. It is important to integrate Geospatial technology into fire risk assessment as it aids in identifying the spatial and temporal patterns of fire danger in a recurrent and consistent manner, and provides knowledge on where and when the fire will produce undesirable effects, is important in disaster risk assessment for assessing the danger and vulnerability, to enable design evacuation routes and the formulation of emergence response. At the recovery stage, it is used to organize data on the damage, rebuilding and for preventing a recurrence. 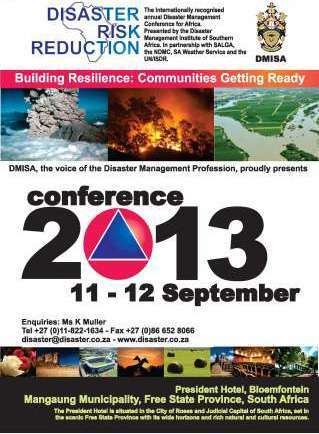 DMISA also encourages Disaster Management stakeholders to use this approach to build resilience in communities at risk. The involvement, training and awareness of communities at risk in Community Based Early Warning Systems CBEWS will enable individuals, communities and organisations threatened by a hazard to prepare and act appropriately and in sufficient time to reduce the possibility of harm or loss. Using this approach, communities at risk will be capacitated to understand Impact Based Severe Weather Warnings and combine the information with indigenous knowledge of the local areas at risk, so that, incident and disaster mortality, the number of people affected, economic loss, damage to critical infrastructure and disruptions to basic services will be substantially reduced. DMISA requests The National Disaster Management Centre and the South African Local Government Association to capacitate municipalities on the use of natural ecosystems to reduce disaster risks and adapt to climate change. DMISA urges all disaster management stakeholders to improve their ability to use natural ecosystems to reduce disaster risks and adapt to climate change. The use of natural ecosystems to reduce disaster risks and adapt to climate change was strongly endorsed by three international conferences in 2015. Wetlands were singled out as one of the best ecosystems FOR community driven initiatives that can be used to reduce disaster risks, adapt to climate change and thus build community and system resilience. This approach also has multiple benefits such as reducing disasters, adapting to climate change, improving biodiversity and building community sustainable livelihoods at almost no cost. DMISA requests to the National Disaster Management Centre to encourage research and practice that strengthens the importance of cultural practice and indigenous knowledge in Community Risk Reduction. DMISA urges all disaster management stakeholders and Academic Institutions to include cultural practice and indigenous knowledge in their programmes and projects. The successful implementation of disaster prevention measures compels the disaster manager to include different perceptions and other understandings, as this will enhance the comprehension and appreciation of the motivations behind people’s actions. Including cultural practice and indigenous knowledge in Community Risk Reduction programmes will enhance understanding and commitment. Community specific disaster prevention plans are prescribed in Section 47(2) of the Disaster Management Act. 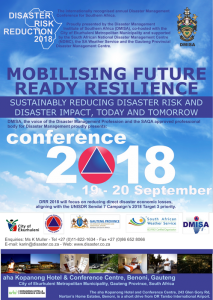 DMISA appeals to the National Disaster Management Centre and the South African Local Government Association to promote a collaborative, people-orientated approach to resilience-building and thereby enhance the success of risk-reduction initiatives. 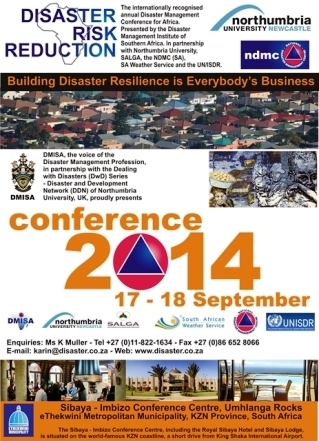 DMISA endorses a collaborative, people-orientated approach to resilience-building and risk-reduction initiatives. The involvement of at-risk communities in collaborative planning and design will result in creating purpose-built solutions that are acceptable to and appropriate for the realities of life in these increasingly complex urban communities. The solutions need to be simple enough to be taken up and embraced by the community members themselves, by using creative thinking to address the hazards being manifested today, especially in urban areas. The extensive use of social media means that it can provide valuable information regarding the location and attributes of disaster related incidents. Disaster management officials must be able to access real time and historical data. The assistance of the various social media platforms will be necessary. Engaging them on a national level will enhance bargaining power and promote uniformity. The relationships can be strengthened through agreements. 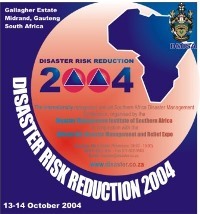 DMISA requests The National Disaster Management Centre and the South African Local Government Association to encourage Municipalities to enter into Mutual Assistance Agreements to ensure that adequate resources are available to deal with the Risk Profile of the Municipal area by augmenting capacity through shared disaster management resources. DMISA encourages all disaster management stakeholders to augment their capacity through shared disaster management resources by means of Mutual Assistance Agreements. During disasters authorities often do not have enough resources to effectively respond and manage the disaster or emergency situation. The recurring dilemma in the interjurisdictional incident management and emergency processes is how to establish and maintain cooperation between organisations in the complex, uncertain environment of an actual disaster and or emergency. Mutual aid agreements are designed to provide a legal framework for an integrated and co-ordinated response to disasters. The primary objective of mutual aid agreements is to facilitate rapid, short-term deployment of emergency support prior to, during, and after an incident and to limit the impact and duration of the crisis. 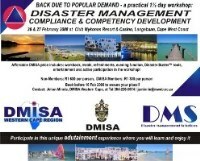 DMISA urges the National Disaster Management Centre to develop standards and guidelines for the different types of disaster, that will provide a sound scientific basis for Disaster Declarations and Classifications. DMISA urges all disaster management stakeholders and Academic Institutions to engage with the NDMC regarding challenges, best practice and possible solutions regarding Disaster Declarations and Classifications. The work currently been undertaken by the NDMC on guidelines for the declaration and classifications are summaries of the Disaster Management Act and National Framework. What practitioners at all level need are specific questions and indicators that will eliminate the guess work and provide a scientific basis on which to evaluate. Many indicators and models already exist. Different approaches are needed for slow onset disasters such as drought and food insecurity. There is a tendency to ignore the” … and post – disaster recovery and rehabilitation.” Part of sections 27(2)(m); 41(2)(m) and 55(2)(m) of the Disaster Management Act. 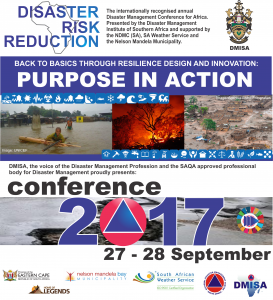 DMISA appeals to the National Disaster Management Centre and the South African Local Government Association to promote Disaster Consequence Management as a best practice in building Resilient Communities. DMISA urges all disaster management stakeholders to assess the possible Disaster Consequence so that they can be managed in risk reduction, preparedness response and recovery and thereby build resilient communities. All disaster management stakeholders must look beyond the hazard when planning for disaster risk reduction, preparedness response and recovery. The real loss occurs in the socio- economic, infrastructure and environmental consequences that are often difficult to anticipate and quantify. Estimating the consequences of disasters and managing both the positive and negative results will result in far more resilient communities, because better decisions will be made to protect vulnerable elements and to focus recovery on “community critical” goods and services. Was held from 21 – 22 September 2016 at ATKV Goudini Spa near Rawsonville and Worcester in the Breede Valley Municipality and Cape Winelands District. To request the National Disaster Management Centre to promote the incorporation clear objectives, equitable processes and the monitoring of equality outcome regarding women, children, the elderly and persons with disabilities in all disaster management plans. DMISA urges all disaster management stakeholders to ensure that the needs of women, children, the elderly and persons with disabilities are adequately addressed in all polices, plans, forums and platforms. To request the National Disaster Management Centre and SALGA to encourage municipalities to develop more adaptive and inclusive models of disaster management by means of disaster management volunteer units with the aim to increase community disaster resilience by enhancing the capacities and skills that exist within the communities they serve. 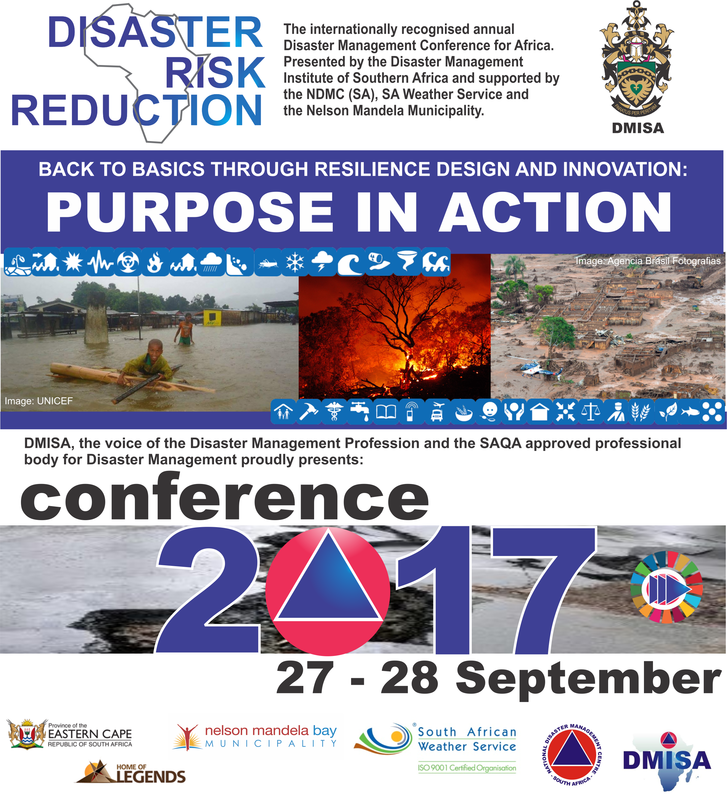 DMISA encourages all disaster management stakeholders to build community disaster resilience through capacitated volunteers. To request the National Disaster Management Centre and SALGA to promote the Integration of climate change adaptation strategies into the management of natural ecosystems such as wetlands to build resilience. DMISA encourages all disaster management stakeholders to ensure that Climate Change adaptation and resilience building strategies are addressed in all development. Particular attention must be given to natural ecosystems such as wetlands. 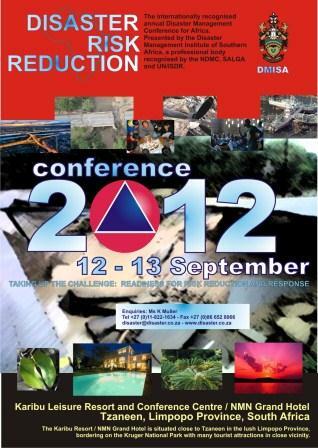 4 Dr Modjadji Malahlela The Implications of the “Integrated Urban Development Framework” for Disaster Management. To request the Department of Cooperative Governance to promote the use of a disaster risk assessment as the basis for all development planning in order to promote sustainable development through disaster risk reduction and to consider the development of legislation that will make disaster risk assessments mandatory in development. 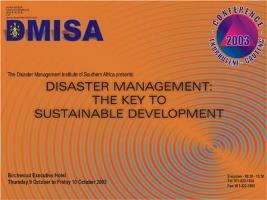 DMISA urges all disaster management stakeholders to ensure that sustainable development through disaster risk reduction is adequately addressed in all development and to lobby for legislation that will make disaster risk assessments mandatory in development. 5 Mrs Patricia Zweig Resilient communities and sustainable development initiatives: Sustainable human settlements and reducing disaster risk in urban and rural settings. To request the National Disaster Management Centre and SALGA to promote sustainable rural and urban disaster management through community based risk assessment and reduction by means of participatory research and collaborative solution seeking. DMISA requests all disaster management stakeholders to include community based risk reduction in all urban and rural development programmes and projects through community based risk assessment and reduction by means of participatory research and collaborative solution seeking. To request the National Disaster Management Centre and SALGA to encourage the building of stakeholder collaboration with Eskom in preparation for a major electrical incident. DMISA appeals to all disaster management stakeholders to collaborate with Eskom when preparing for major electrical incidents. 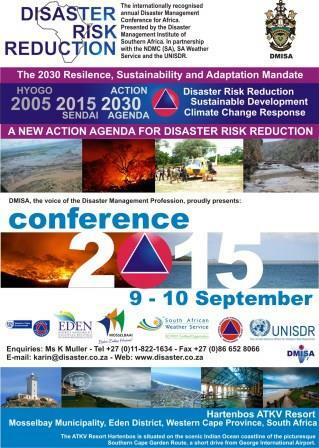 DMISA applauds the National Disaster Management Centre on the Amendment Act and supports the need for all stakeholders to embrace the changes relating to Climate Change, the role of Local Municipalities, focus on vulnerable persons, participation of sector departments, in order to promote sustainable development. DMISA also appeals to SALGA to urge municipalities to embrace the Disaster Management Amendment Act, 16 of 2015 relating to Climate Change, the role of Local Municipalities, focus on vulnerable persons, participation of sector departments, in order to promote sustainable development. 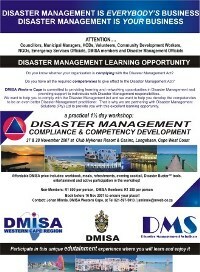 DMISA urges all disaster management stakeholders to familiarise themselves with the content of the Disaster Management Amendment Act, 16 of 2015 and to align all activities to the legislation. 4 Mr Thinus Rabe The need for rapid impact assessment model specifically suitable for rural areas To request the NDMC to pursue and promote the development of a rapid disaster impact assessment, specifically suitable for rural areas. 5 Mr Daniel Brink Conceptualising resilient communities Request the NDMC to facilitate greater dialogue between the fields of disaster management and urban/town planning in recognition of the collaborative potential for achieving resilient development. 6 Prof. Ozunu Alexandru Bulding resilience in small isolated mining communities – Romanian case studies To urge the National Disaster Management Centre to ensure that Municipal Disaster Management Centres achieve sustainability and long term resilience for small isolated communities. 8 Mrs Francis Hoets Community Based Early Warning Systems: From Theory to Action: The Role of the Disaster Management Practitioner To urge the NDMC to promote improved cooperation between Disaster Management Centres and the National EWS in order to facilitate communication to at-risk communities and to document and share best practice cases. Please note: Current-day provincial and town/city names are used in this list in cases where names have changed in the period from 1986.